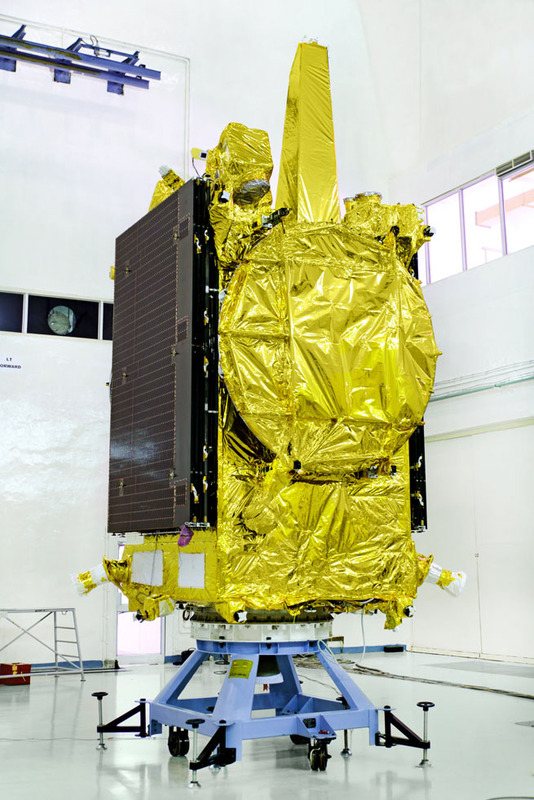 GSAT-19 is a Geostationary Communications Satellite developed and built by the Indian Space Research Organization for operation by telecommunications provider Insat. 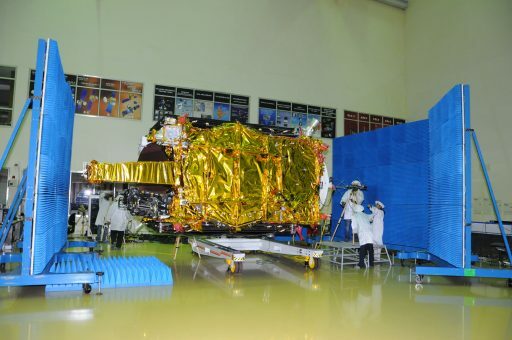 Launching on India’s new GSLV Mk.III rocket, GSAT-19 sets out to demonstrate a number of advanced spacecraft technologies and deliver high-throughput Ka/Ku-Band telecommunications coverage while also measuring the radiation environment in Geostationary Orbit over a nominal mission duration of ten years. GSAT-19 is based on ISRO’s I-3K satellite platform for spacecraft in the three-metric-ton-class. The spacecraft has a launch mass of 3,136 Kilograms, including a dry mass of 1,394kg and 1,742 Kilograms of propellant. In its stowed launch configuration, the craft measures 2.0 by 1.77 by 3.1 meters in dimensions, deploying a pair of 2-meter reflectors and two three-panel solar arrays once in orbit. The satellite’s communications package comprises 4 Ka x Ku Forward Link and 4 Ku x Ka Return Link Transponders plus Ku and Ka beacon transmitters to deliver high-throughput communication beams with a 4Gbit/s capacity for a variety of data-intensive services. In addition to its two-meter side reflectors, the satellite hosts a 1.4-meter steerable antenna on its Earth-facing side. 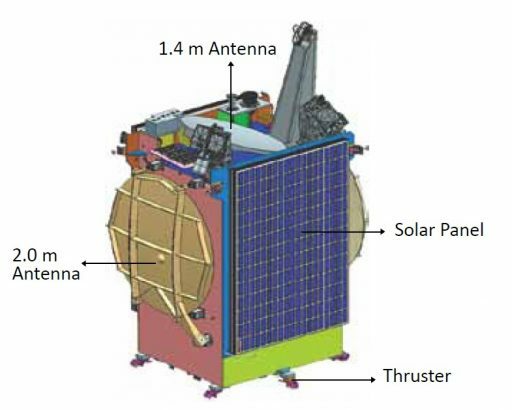 As an auxiliary payload, GSAT-19 carries GRASP – the Geostationary Radiation Spectrometer that will be tasked with measuring the influx of charged particles in the Geostationary Orbit Regime and assess their effect on satellite electronics. GSAT-19 hosts a number of advanced systems undergoing demonstration tests to clear the way for their operational use on future Indian-built satellites. 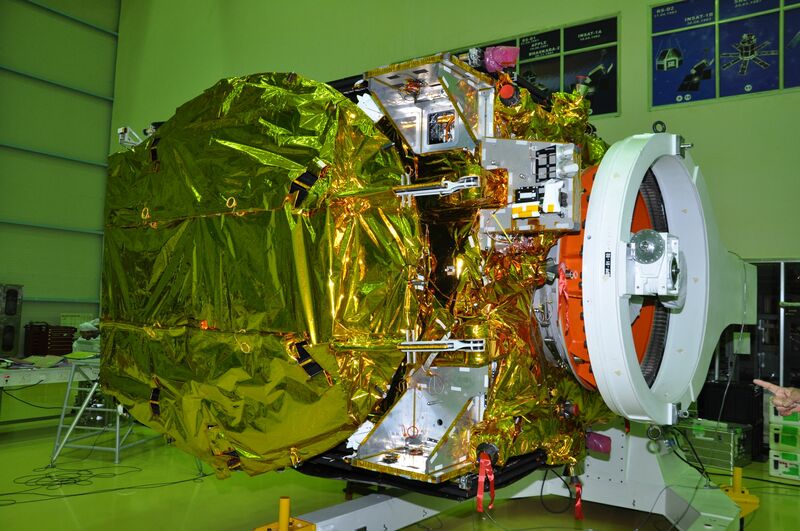 Among them are miniaturized heat pipe technology for more efficient thermal regulation, fiber-optic gyros for attitude determination, Micro Electro-Mechanical (MEMS) accelerometers, a Ku-Band telemetry/telecommand transponder, and Li-Ion batteries produced indigenously in India. The satellite’s structure relies on a central cylinder made of Carbon-Fiber Reinforced Polymer which facilitates the craft’s propellant tanks and acts as the structural backbone, carrying launch vehicle and propulsive loads. It also acts as the primary mounting structure for radial aluminum honeycomb panels which hold the various subsystem components and electronics boxes while also providing the structural interface with the outer panels and deployable elements. 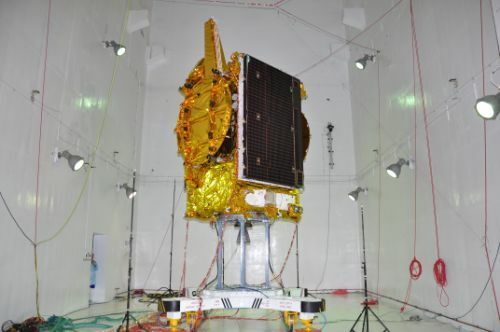 GSAT-19’s two deployable Solar Arrays generate a total power of 4500 Watts, fed to a single 100 Amp-hour Li-Ion battery. 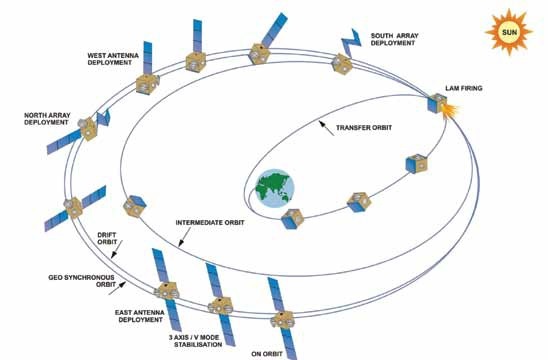 The three-axis stabilization system of the satellite relies on Sun, Earth & Star Sensors and gyros for attitude determination and momentum wheels, magnetic torquers and thrusters for attitude actuation. New for an Indian satellite is the use of fiber-optic gyros and MEMS accelerometers for the measurement of three-axis body rates and accelerations during propulsive flight phases. A MEMS gyro employs a vibrating structure gyro system featuring a silicon ring fixed to a structure in which vibration is induced using a small electric current. Lateral motion of the ring – caused by coriolis force – can be measured to deliver a signal proportional to the rate of motion along the sensitive axis. The momentum wheels are rotating inertial masses that are driven by electric motors. When accelerating or decelerating the wheels, the satellite body to which the wheels are directly attached will rotate to the opposite direction as a result of the introduced counter torque. Torque rods with redundant coils are used to create angular momentum by running a current through coils in the presence of Earth’s magnetic field. The torquers are regulated by computers that control the current that is passing through the coils in order to control the force generated on each axis. The magnetic torquers are used during momentum dumps from the wheels and for attitude control in spacecraft safe mode. 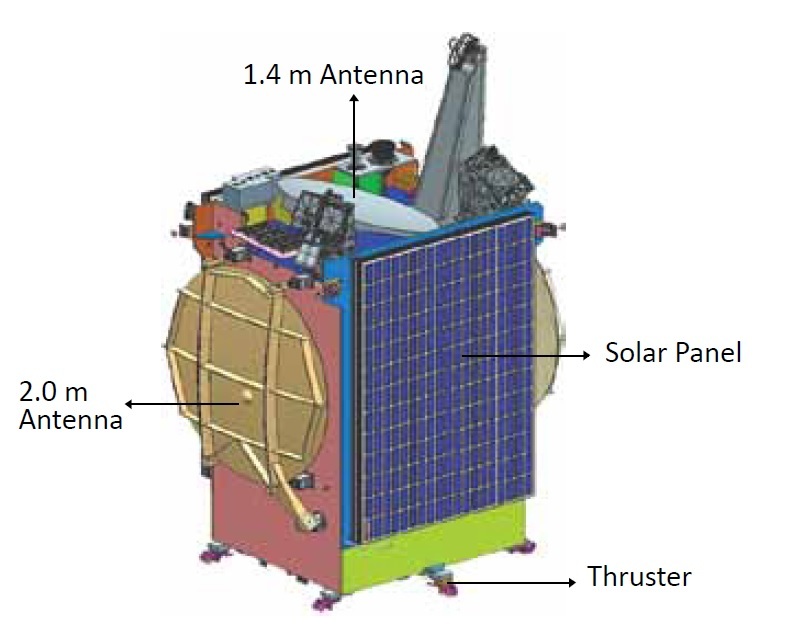 The propulsion package of GSAT-19 is a standard system used by a number of ISRO satellite projects comprising the trusted Liquid Apogee Motor for apogee-raising maneuvers while eight 22- and eight 10-Newton thrusters are used for attitude maneuvers and stationkeeping in Geostationary Orbit. All three engine types use hypergolic propellants, MON-3 oxidizer (Nitrogen Tetroxide with 3% Nitric Oxide) and Unsymmetrical Dimethylhydrazine as fuel. Tank pressurization is accomplished by using high-pressure Helium. 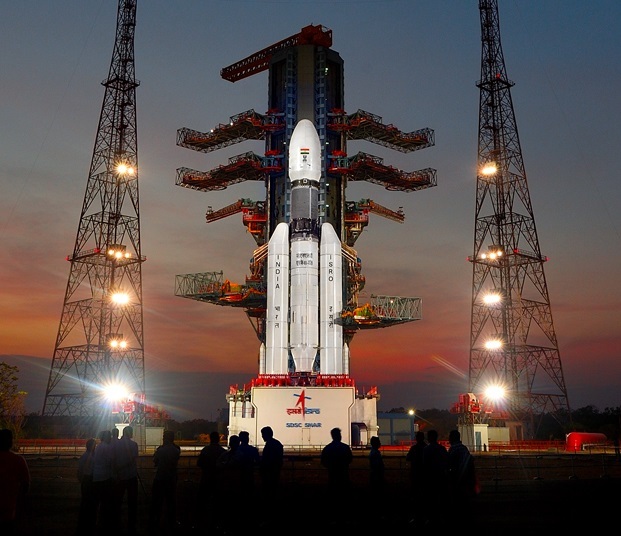 Copyright © 2019 GSLV Mk.III D1 | Spaceflight101. All rights reserved.